Okay so if you are anything like me then you have seen the ads for the Thin Lizzy and been left clueless as to how this one product has six different uses. There is also word that this could be a great dupe for NARS Laguna. I'm not going to lie, I am an extremely skeptical person and this product was no exception. So in this post I give you my no fluff opinion and honest experience on the Thin Lizzy product as well as a look into the brush, gloss and liner. So when I first heard that this product could be a dupe for the high end, cult classic NARS Laguna I could not for the life of me figure out how that was a possibility. After all this product is supposedly a 6 in 1 and surely that has to include base coverage...WRONG! I had the completely misunderstood this product and it dawned on me that it is a multitude of shades darker than I expected it would be. Things were starting to make sense now and an image was forming in my head about how this could potentially work as a blusher, bronzer and contour product. Before we get into it, please note that my shade is in Light but there is also a Dark option available. Read on to find out more about the six uses this product claims to fulfill and my thoughts on each purpose. Eyeshadow- As an eyeshadow this product gets a big thumbs up from me because it is a great neutral brown for the crease. It blends easily and works in well with other eyeshadows. Blush- It gets another golden star for being a lovely bronzed blush option perfect for Spring and Summer when all you want is to look like Gigi Hadid at the VMAs. Contour/Face Framer- I call foul on passing this product as both a "contour" and "face framer" because to me they are the same thing. With that being said, yes this is a great contour and shading product that draws a lot of similarities to the NARS Laguna bronzer. Lip Colour Next up we have the lip colour and as someone who can't pull off mocha or brown hues this use is not a personal favourite but it can work. It provides a nice natural flush of colour to the lips, most noticeable on very pale lips. Body Bronzer- Lastly we have the body bronzer and this is another use that I would rope in with the contour and face framer purposes. My overall sentiments are that I really do love this product as a bronzer and to me that is exactly what it is. 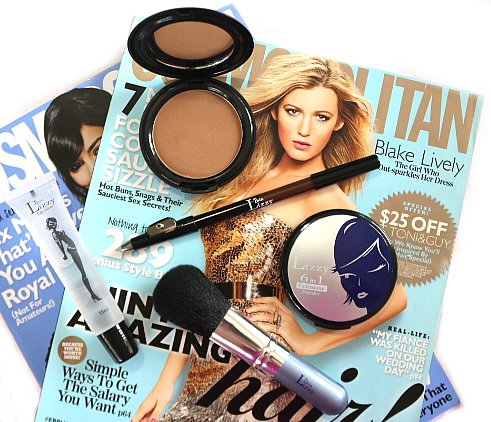 It provides contouring, shading and body bronzing uses like your standard good bronzer will. Most bronzers can become an eyeshadow colour or a lip product colour but do you really want it to be those things? Personally I m very content with having found this product as an incredible bronzer that I love using to contour and bronze up my face. The biggest benefit of this product is definitely how versatile the formulation is, working on numerous parts on the face for different purposes. The gloss, brush and duo eyeliner products are very standard and around a similar quality to Essence (a brand of which I love). For the $48.95 you do get 2 of everything - 2 Thin Lizzy powders, glosses, brushes and liners. You can't deny that it is great value. You can purchase this set here from Priceline.